I’ve been meaning to write about one of my new favorite cartoonists, Jorge Zaffino, for a while. The Argentinian artist started working in American comics in the late 80s and throughout the mid 90s. As a kid I only saw his work in comic book ads, being that my local bodega didn’t sell Punisher graphic novels or Epic Comics. I was reminded of his work when he contributed to the excellent Batman: Black & White anthology series [#2, July ’96], and I’ve been a fan since. 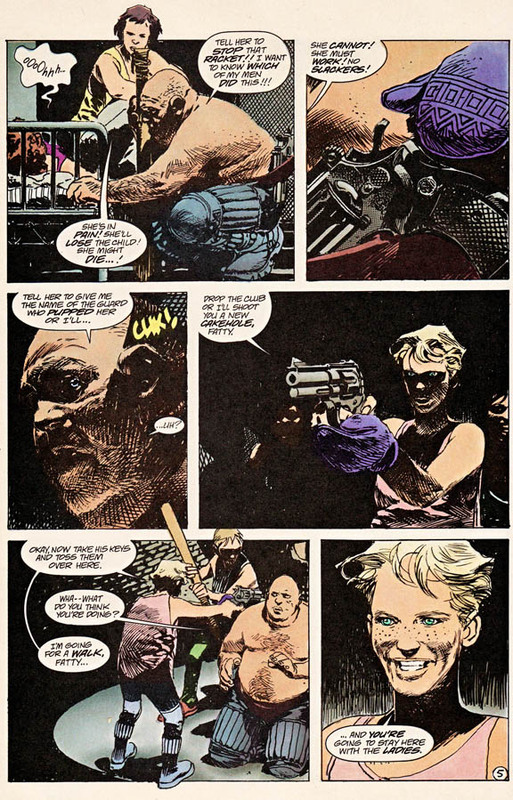 Zaffino’s most frequent collaborater, writer Chuck Dixon, discovered him through Ricardo Villagran. 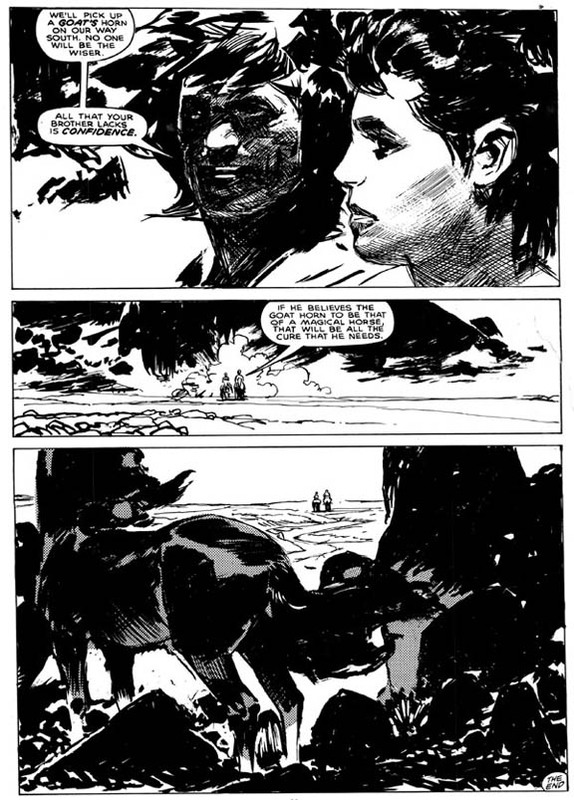 Dixon immediately recognized Zaffino’s talent and began working on what was to become WinterWorld (originally published by Eclipse). 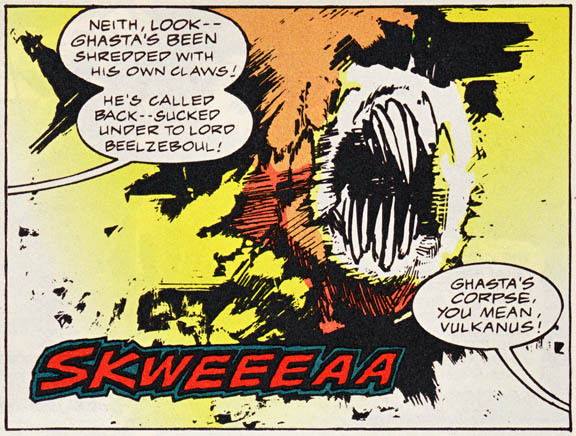 The art in it owes more to Joe Kubert than Attilo Micheluzzi, but that changed in the span of an issue or two. The main thing I love about Zaffino’s work is that his inking may seem very loose, but it’s actually quite thought out. Such deliberate application makes inking seem like a challenging and fun task. Keep in mind, when I mention inking, I do so in regards to the method in which the majority of the drawing is done in ink, not the traditional method of having a tight pencil drawing as a strict blueprint to work from. I’m not entirely sure if that was how Zaffino worked, but the end results suggest that inking (as a school of thought) was made to be bolder. Despite his fancy inking (he was an excellent painter as well), it’s Zaffino’s naturalism that adds dimension to his art. It’s the kind of naturalism that Garcia-Lopez and Jaime Hernandez have, where even without photo ref their pure drawing ability makes the work more “realistic” than any traced drawing could ever hope to be. It’s a sensibility that is completely missing from comics today. Things are either super stylized or hyper traced. That’s less of a criticism and more of an observation. Maybe cartoonists aren’t hardwired to draw like that anymore. It’s the kind of drawing that only comes from rigorous, old school art training and study. I want to express what I mean by “naturalism” without beating a dead horse, but I can’t quite pinpoint it. Zaffino’s work is not illustrative in the classical way yet it relies heavily on a solid foundation of actual drawing skill. What sets him apart from, say, a Bryan Hitch type of artist, is not only his strong design sense, but the subtlety of human body language expertly portrayed, never stiff, never traced, and always expressive. It’s said that Zaffino wasn’t a fan favorite and it’s pretty easy to see why. Although his sophisticated, post-Toth sketchiness impressed his peers and editors, most of Jorge’s American work came within a period where fandom was eating up the hyper slick approach that dominated the stands. The style I’m referring to, a marriage of Manga and Michael Golden, was a widespread phenomenon in the 90s (and beyond) and left little to no room for artist’s like Zaffino to cultivate their comics voice any further. Zaffino didn’t work much for the big publishers past 1991, but what little he produced was always excellent, well worth taking note of. 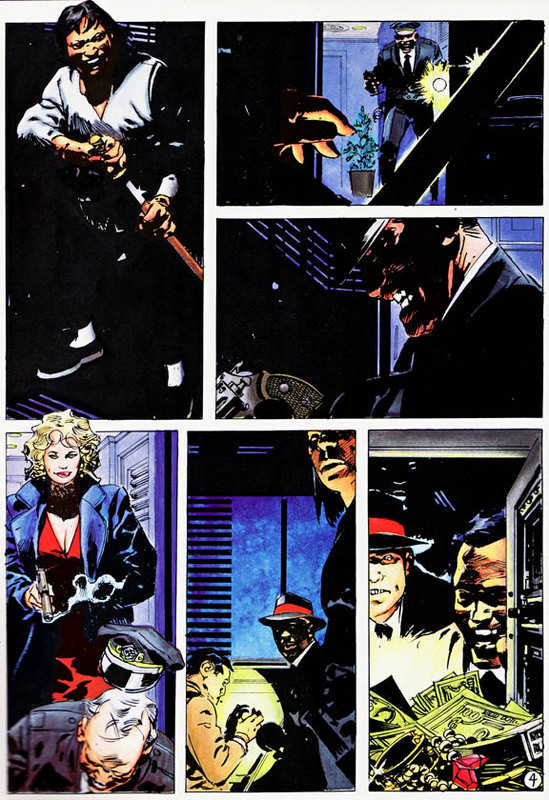 Denys Cowan, who is largely influenced by Zaffino, has a great story about meeting him back in the day. Check out the Denys Cowan interview (the Zaffino and Alberto Breccia stories in the beginning of the lengthy interview). IDW has released a reprint of Winteworld in black & white (with some extra unseen material). 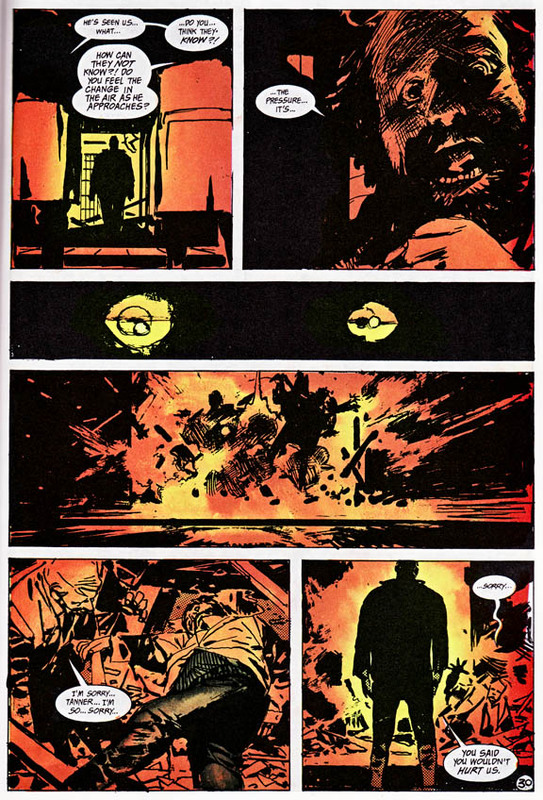 Funny how while Zaffino’s work seems to benefit from the black and white production, his work was mostly in color (sometimes transforming the rich black areas into muddled grays). With this new collection of older material, we’ll get to see his ink work the way it deserves to been seen. But forget production values or industry trends. 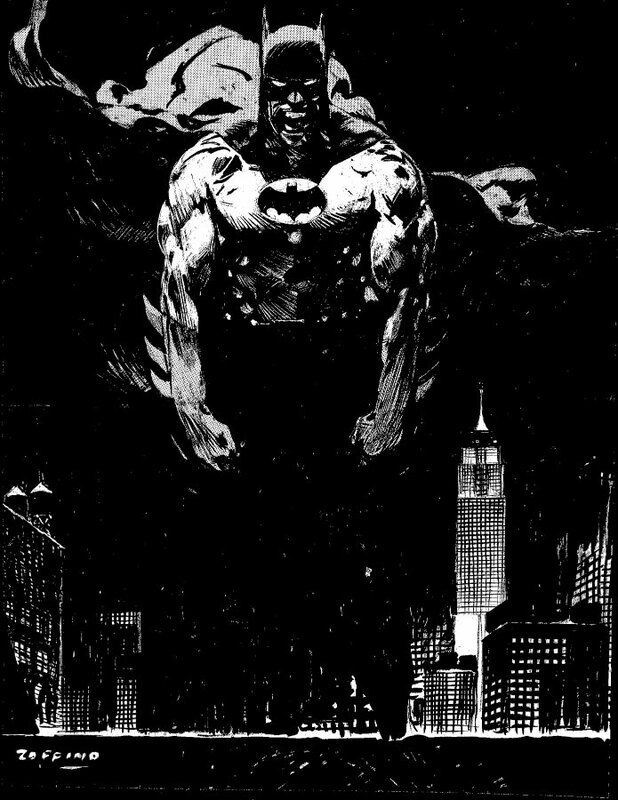 Zaffino’s work will always be amazing. It still holds up today and although he’s always been on my periphery, I’ve slowly developed a strong fondness for his work. I’ll have to trace back and look for his older material to fulfill the completist art geek in me, but the comics I already have of his will last me for a long time. I remember Winter World! I have all the issues I think. I just picked up the IDW collection of Winterworld. It blew me away! Thanks for doing this post for further blasting me into the outer reaches of the Zaffinoverse! Love love LOVE Zaffino! 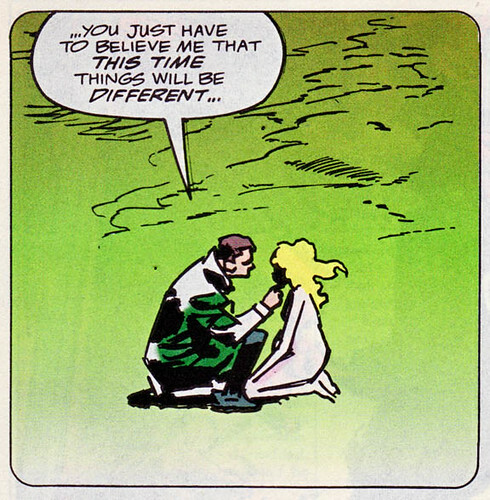 He was so obviously a class act when Winterworld appeared and so obviously from a whole other tradition. No shortcuts, no glib linework, superb craft and draftsmanship. That Winterworld collection is a must buy. it was accidently in just the perfect place. you talked about isn’t completely missing from comics today (just mostly). I know Farel dalrymple is a fan of Zaffinos and has some serious chops of his own. Yeah, Farel has the chops, but he’s also got that alt comics sensibility imbedded in his DNA, which is how I mostly see his work. But you’re right, it’s not completely missing… Mazzucchelli, who can turn whatever style off and on, has that naturalism, that weight to the figures. So does Goran Parlov (current Punisher artist). Frank Quitely, while really stylized, has some of the most subtle body language chops going on in comics. Jorge was indeed an “artist’s artist.” Whenever he’d send in a package of new pages of the first Punisher graphic novel, it was like opening up a Christmas present. As word got out that new pages had arrived, visitors would pop into my office to dig into the flat files and practically drool over the Jorge’s work. Jorge was also a very nice person and a pleasure to work with. i found those issues of winterworld in a 25 cent bin when i was a youngster. zaffino immediately became my favorite artist. i used to shamelessly try to rip-off from that guy. he’s still is one of my all time favorites. i went nuts when i heard winter sea was finally seeing print. good for idw. it is a crime that that stuff hadn’t been published until now. thanks mf for posting about him. Zaffino was one of those artists I just did not understand when I was a teenager. Like Tony Salmons. I thought “these guys just don’t know how to draw!” Idiot. I’ve been lucky enough to get some Zaffino originals and really study what he was doing. Like a lot of great comic artists, you can see that he’s doing more AND less at the same time. . .a lot of the work is just perfect right off the bat, no real struggle on the page at all, just great drawing. And then the following panel will be something that has been worked, reworked, whited-out, etc. What a fantastic artist–there are things in SEVEN BLOCK, which has been published in a couple different formats that I’m aware of, that are genuinely frightening, eerie, not just the simulacrum of “scary” that we get a lot of times in comics. I was a intern at Marvel while Jorge Zaffino was getting a lot of work there. I still have “Kingdom Gone” and look at it often for inspiration. I loved his fluid and languid, yet realistic style. Truly an amazing, underrated artist. Carl, thanks for the story… is it too farfetched to suggest you probably had the Best Job Ever? Farel, I got Terror Inc. from the dollar bins and it blew me away (I also couldn’t believe it ran as long as it did; Zaffino hardly did monthly jobs). Also, I’m not sure if it’s out yet, but IDW is re-releasing Seven Block as well. I hope it’s B&W, too… and now that you mention it, I can totally see a trace of his influence in your stuff. Matthew, don’t even get me started on Salmons. Have you checked out his latest Lovecraft material? It’s fantastic. Anyway, seeing original comic art is such a different experience, I can only imagine what a Zaffino original looks like. GAH! I’m jealous. I wanna hear more about old school interning at Marvel, Cold is the Sea! I think that naturalism is still to be found in, as mentioned above, Mazzuchelli, Jaime Hernandez, Rick Leonardi, RM Guera and to a certain extent JRJR. I think we’re lucky to live in a time when so much is being reprinted and collected in decent collections. Hard to think how bad things were in the ’90s and early part of the last decade. Also, the IDW reprint of Seven Block came and went a while back, about a year before the WInterworld collection. There’s also a Zaffino story in one of the Epic Hellraiser anthology comics, in case you haven’t seen it; 20 pages or so. Great blog. Not enough can be said about Jorge Zaffino, a legend taken from our community (and his family), before his time. What I find so impressive about his work is how no line is wasted. Every line used — and not used — describes form and/or light. His gestures are incredibly organic and fluid. The guy could just flat out draw. Simply a master draftsman and a brilliant storyteller. I look at his work and see a wealth of knowledge and understanding which to this day I’m still trying to absorb. I’ve been on a mission to find everything he’s done but keep getting stumped. Winter World B&W — check. Hellraiser story — check. Seven Block B&W — on it’s way via Amazon, but what I really want is a copy of his sketchbook and I’ve had no luck. If anyone can point me in a direction I’d be eternally grateful. I’m even interested in scans of the pages if anyone’s got them. If I’m missing a “must have” on my list, please let me know. Will, I haven’t read the Hellraiser story. I know it’s up on Zaffino’s website, but I’d like to wait until I’m holding a copy to really see it. As for the point on artists, I definitely see it more in JRJR than in Leonardi’s energetic cartoons of Guera’s semi-stiff realism. I would add John Paul Leon to the list. Jordan, I would suggest everything on the post above: The 2 Punisher graphic novels and the Conan issue. Don’t forget Batman: Black & White #2 as well as Terror Inc. #1-7, published by Marvel back in the early 90s. Good luck finding the sketchbook! Great post entry. I’ve dedicated one to Zaffino myseelf some time ago. I completely subscribe your observations. If you check Wikipedia’s entry for Zaffino (the one in english) you’ll find a link to a lot of material I’ve been able to collect on the internet (I see you have here a couple of scans I’ve missed). 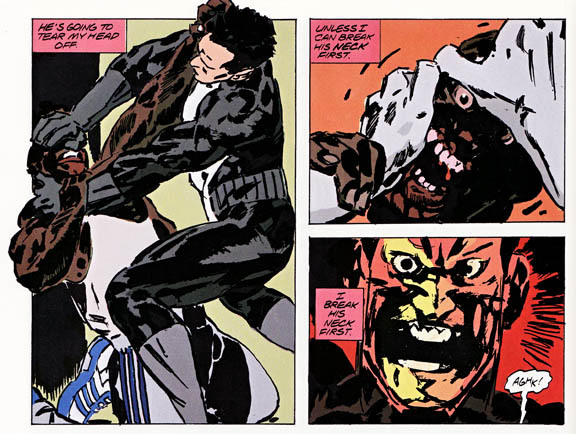 Two artists I tend to “link” with zaffino a re Hugo Pratt (especially in his earlier years) and Alberto Breccia (whose rendition of the Battle of the Thermopiles in the last issue of Mort Cinder is far better than Frank Miller’s 300, IMHO). Still, I prefer Zaffino to those two. He NEVER fallen in the trap of manierism and always served the story. He’s my favorite artist. You mentioned the hyper-realism and outright tracing as your observation of current comic art. I’ll go ahead and state it is my number one personal criticism of comic book art today. I can’t stand it! While it’s not quite killing the industry, it is highly limiting as to the type of stories that are being told. Not everything can look like still shots for ’24’ or a Hollywood actioner. Zaffino and his ilk suggested and the reader is invited mentally to provide closure to the image. Plus when you have mastery of line and shadow and naturalism like Zaffino, you are not beholden to reality and become free to pursue any type of story in any style. As opposed to other artists of today that need to reference EVERYTHING or they can’t draw it. I mean to add that I that I have the Zaffino sketchbook. There are some pages from it in my blog post. It may not be a bad idea to do a scan of the whole thing for interested parties. Let me know. As an artist myself, I completely agree with what you said. I’m VERY interested in scans of the sketchbook. I went so far as to go to the publisher’s website. I emailed them (in English), but never received a response. Let me know what I can do to facilitate the scans. Rick Leonardi’s (equally amazing) run in Spider-Man 2099 reminds me a lot of this man’s amazing, narrative style. Moving tribute to another creative talent that died far too young. At his age, he was better than Kubert, Ditko and even Hal Foster (though he had the benefit of their history). Thanks for writing this post. That work hasn’t been translated or released in the states as far as I know. There are some scans of it floating around online, thankfully — mostly via his son’s Facebook page.